Lee Johnson has backed Brighton & Hove Albion to go on and win the Championship, but said his Bristol City 'bridesmaids upset the bride' today at the Amex. The Robins manager, who scored in his only appearance for Brighton at the start of his playing career in the Football League Trophy, saw his side prevent Albion lifting the league title with a 1-0 victory. Josh Brownhill's first-half header crashed the party atmosphere and stopped the Seagulls from securing the title in their final home game of the season. The points meanwhile secured Bristol's safety in the league, but Johnson was full of praise for his former side. 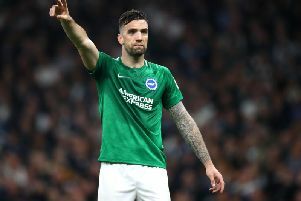 He said: "I came out honestly and openly saying that we respect Brighton for the fantastic team they are, but today we were the bridesmaid trying to upset the bride. "We were the party poppers and I won't apologise for that as we needed to be as it was an important game for us as well, in terms of looking ahead at next season. "Live on Sky we have beaten the best team in the league and quite comfortably as well. "It was a fantastic start and finish and we have a very, very bright future with some great youngsters and under-23s coming through, like Solly March at Brighton. "If you look at the model Brighton have got it is very similar to what we are trying to achieve." And asked if he thinks Brighton can win the league, Johnson added: "I do yeah, I really do. In my opinion they are the best side in the league, although Newcastle have done great as well. "The manager (Chris Hughton) is top, top draw and for a young manager like myself, I can look up to, learn from and study him."